If you were to be able to travel forward in time by about 7 billion years and take a look at our parent star, what might you see? What would the Sun, by then weary with old age, look like? Actually, it would probably look a lot like this. This is CW Leonis (better known to some as IRC+10216°), and it’s nearing the end of its life. Despite my (fairly obvious) personal fascination with supernovae, not all stars meet their demise with quite such violent force. That isn’t to say, however, that the demise of these stars is any less dramatic. CW Leo here, slightly less massive than the Sun, is an AGB star. In fact, it’s our friendly neighbourhood AGB star, being the nearest one to Earthat around 400 light years away. AGB stands for asymptotic giant branch — most people don’t realise that in a star’s old age, it actually has two giant phases. You see, all Sun-like stars follow a set pattern. Stars in the main part of their life are called “Main Sequence” stars. Content to burn the hydrogen in their cores, they tend to be quite stable during their lives, providing warmth and sanctuary for whatever planets they may carry in tow. But sadly, as they say, nothing lasts forever. Once the hydrogen in the star’s core is exhausted, the nuclear fusion there grinds to a halt. The star’s core is now full of helium, and there’s not much that can be done with that. Not yet. With less energy being output, the core shrinks as gravity tries to crush the star in on itself — but this causes a sudden increase in pressure. Fusion flares into life in a shell around the core. As this shell of material burns hydrogen, it dumps more helium into the core, and gradually more and more fusion begins to happen in this shell instead. More fusion means more energy. All of that energy has to have some effect, and the effect is for the star to start to swell up. Gradually the star bloats into a red giant. Currents of starstuff circulate within the red giant, mixing stellar material and allowing more and more hydrogen to be burnt. The core of the star becomes hotter and hotter until finally, it can’t take anymore. When the core of the star hits around one hundred million degrees, helium fusion begins. And it begins dramatically. A helium flash is the (frankly rather cool) name given to what happens next. A runaway nuclear reaction of helium fusion, fusing around 80% of the helium in the star’s core in a matter of seconds. The energy output from something like this is quite literally explosive. During a helium flash, the core of the star briefly has a power output greater than a small galaxy, but trapped deep inside a giant red star, most of this energy will never reach the surface or be seen by anyone. For a little while, things become stable again, with a nice fuel source of helium in its core, the star settles down. That is, until that helium too runs out. The star is now an AGB star — called an asymptotic giant because it appears much like a red giant.★ At the beginning of this second giant phase, a star will be full of oxygen and carbon from all of the nuclear fusion it’s recently been through. All of that material gets dredged up as the star becomes even larger and more luminous than before. It’s powered now by not one, but two shells surrounding its core. A helium shell and a hydrogen shell power the star now, and with all of that power output, the star becomes unstable. Thermal pulses begin, as all the energy released by fusion starts to blast the star apart. Every few thousand years the star contracts, causing a huge flurry of nuclear fusion within. Lasting for hundreds of years, these bursts of energy drive the star to expand, blasting away a layer or stellar material. 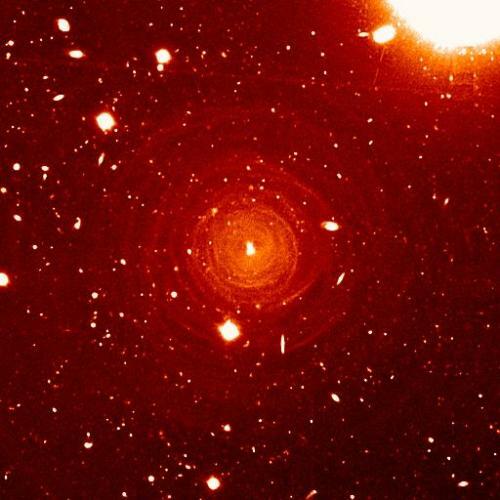 Those concentric rings you can see in both of these images of CW Leonis? They’re starstuff which has been blown away as the star itself sputters like a candle flame. 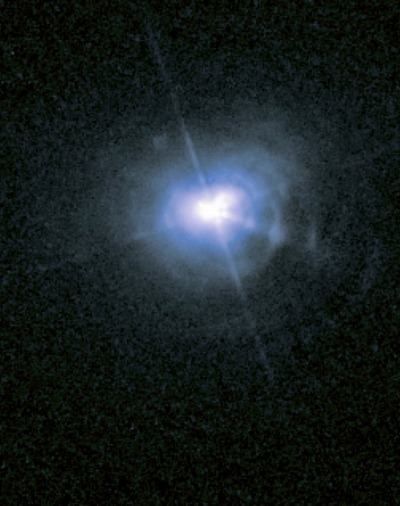 As a result, these AGB stars are surrounded by some pretty fascinating things. Curious chemicals condense around them, born from fresh stellar material cooling in the stellar breeze. Unusual molecules gather and react. CW Leonis here, being our nearest AGB star, has been studied extensively. It’s wrapped in a veil made up of molecules of all kinds. As AGB stars progress through their lives, they become richer and richer in carbon. Finally, with one last exertion, the star pulses its last. Any remaining outer layers of the star get blown away into space as it’s core, a furiously hot ball of carbon and oxygen, collapses into a white dwarf. The star ends its life in a grandiose way, blossoming into a dramatic planetary nebula spanning a few light years, before slowly dissipating into the dark. ★ The specific reason relates to the Hertzprung-Russell diagram, used to show the relationships between the luminosities and temperatures of stars… But I don’t really want to start talking about charts and things here and now. This entry was posted in Imported from Livejournal and tagged astrophysics, interstellar medium, stars. Bookmark the permalink.